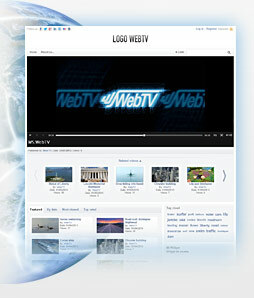 WS.WebTV Free is a free, feature-limited, version of the WS.WebTV Professional. It is intended for non-commercial / non-profit applications. WS.WebTV Free is a WebTV (a video portal...) and VMS (a Video Management System) solution, and it is also a CMS (a Content Administration System). A WebTV is a Web page dedicated to showing online video content. WS.WebTV Free allows you to create your own video channels in Internet, with your own content and with your own identity; without depending on other Websites like YouTube, Vimeo, etc. WS.WebTV Free also has a variety of social tools that will help you in distributing your content into the social networks. Additionally, WS.WebTV Free is intended to be hosted in YOUR SERVER, so unlike other WebTV solutions, the files are stored in YOUR SERVER not on ours. Use the hosting service of your choice as long as it meets the minimum requirements. WS.WebTV Free is suitable for non-political/non profit NGOs and, in general, for freelances (portfolio), individuals, associations and organizations interested in having a non-commercial/non-profit WebTV.